Sundown means playtime for most nocturnal animals, and your hamster is no exception. He does it in the dark, and that naturally means making noise. If it's keeping you awake, take steps to reduce how much of the nighttime racket you hear rather than try to keep him from making noise at all. Keeping him from doing his thing puts him at health risk. Respect your hamster’s sleep schedule. While some hamsters may wake for a few hours during the day, all hamsters are nocturnal creatures that are most active at night and spend the majority of the day sleeping. Trying to modify your hamster’s sleep schedule to better suit your own will create a stressful situation for your furry friend that could potentially compromise his health and negatively influence his mood. To avoid disturbing your hamster’s slumber, make an effort to reserve all feeding, handling and cage-cleaning duties for the late afternoon or evening hours. Choose the cage location wisely. Consider your hamster’s sleep schedule when determining where to place his cage. Since your furry friend will have an active nightlife that tends to get somewhat noisy, your bedroom is not an ideal location for his cage. The best spot for a hamster cage is a dimly lit room where he can sleep soundly during the day and where his late-night escapades won’t keep you up. Place your hamster’s cage away from direct sunlight in a corner of the living room, in a bathroom or in a separate room where he can keep his natural sleep schedule without disturbing yours. Choose the right kind of exercise wheel. Though removing a noisy exercise wheel at night might seem like a good way to keep your hamster quiet, leaving your furry friend without a wheel is as bad for his health as it will be for his mood. 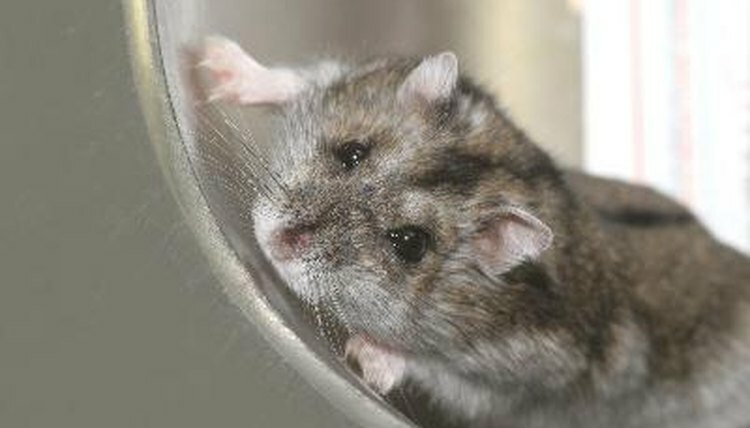 Exercise is crucial to your hamster’s health and emotional state. Your furry friend needs an exercise wheel to help him release pent-up energy and have a little fun. Since traditional, metal wheels can get rather noisy with squeaky turns, some manufacturers produce special exercise wheels that are specifically designed to be silent. Choosing the right exercise wheel that can spin quietly into the night can help keep you as happy as your hamster. Choose the right kind of hamster cage. While traditional cages with metal bars are a popular housing choice, they can be noisy if your hamster decides that the metal bars are fun to chew on. Housing your hamster in a durable plastic enclosure can greatly reduce nighttime gnawing noises. Including nontoxic chew toys in his cage to keep him quietly entertained at night can also help. Play with your hamster just before you go to bed. If you make it a point to play with your hamster in the hours prior to your bedtime, he is more likely to be tired and a little less active after you fall asleep. Encourage your hamster to run on his wheel for a while before you go to bed so that he gets it out of his system early and makes less noise while you sleep. Remember that the best time to handle your hamster is in the late afternoon or evening hours. Not only will it help you to so respect his daytime sleep schedule, it will help him burn off some energy before you turn in for the night.  Owning a hamster means accepting a certain level of nighttime noise as inevitable. While sleep schedules, cage location and silent wheels or toys can help keep the noise at a manageable level, your hamster’s health and well-being depend on his ability to live a natural nocturnal existence without much interference from you. Owning a hamster is much more enjoyable for night owls than it is for morning people. ⚠ Waking your hamster out of a deep slumber is likely to put him in a cranky mood and make him more likely to bite. If you must wake your hamster from his sleep, do so as gently as possible by talking to him in a soft tone of voice. Unusual Pets: What Is the Best Hamster Wheel for Your Pet?